Khrandûm “Iron Flute” Hect, most humies (humans) just call me Krahn. Adventurers, Why do you need me? Every party needs a lore master, and I’m chuck full of it, and not afraid to use it! For diplomacy, negotiations, barter, I’m your Dwarf! 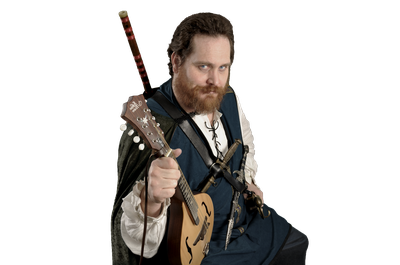 When the party is feeling down, who better than a boisterous bard to raise spirits? In addition to my many musical, singing, and storytelling talents, my magics will help the group when it matters most for persuasion, languages, disguise, illusions, and healing. I am a Dwarven Bard. Though from early in my childhood, it was clear I am not like other Dwarves. As I grew, I was much lankier, and taller, than my peers. While I was growing a beard sooner than they, it has never been as long or as full as the others in adulthood. Though never one to shirk hard work, once a day’s heavy tasks were complete, while others would rough house and work in the smithies, stonemason halls, or other physical crafts, I was studying histories, cultures, and especially music and stories. As I began to pass 5’ in height at an early age (especially for a dwarf), some began to claim, and taunt, that I wasn’t really a dwarf, but actually a Humie (human). Some claimed I was actually adopted. This lead to many a brawl in my youth. Okay, even to this day, anyone besmirching my Dwarfhood should be ready for fisticuffs. At 6’7” (200 cm) I just happen to be a little taller than average. My parents fed me very well… And my aunt would explain “it’s just a glandular thing”! It started at a young age. While generally affable, exceptionally outgoing, and a bit of a stage “ham”, there was clearly a deeper introspective side, and unlike many of my Dwarf kindred, I am generally very difficult to push over the edge to anger. Unless you question my being a Dwarf! I studied books of lore and music constantly, and eventually begged to join the Bardic College of Lore by correspondence. My parents were wealthy enough to cover the costs, though many snickered at my interests being bizarre for a Dwarf. At first my parents were just poor traders, but they were involved with politics and well respected for their counsel, and often swayed the other clan leaders in decisions about dealings with other Dwarf tribes, other races, and other cultures. They often traveled to negotiate trade deals favorable to our clan. While they often took me on the road, during their longer and more dangerous trips I would stay with my aunt and uncle. When I was about 12 years old, my parents went missing for over a year during one of their many journeys. Expected to be gone for 6 months, no one worried until they were long overdue. By the 9th month, several efforts were made to search for them, but not a trace was found, and it was assumed they had been killed. Then after a year and a half after they left, they suddenly appeared. They were road bedraggled, their clothing heavily worn, but bearing with them significant wealth, supposedly a fraction of what they claimed they had acquired during their absence. The said were attacked on the road by some Duergar and other creatures of the dark. My parents managed to fight them off, and then chasing them over weeks of pursuit and skirmishes, taking them far off their original course, the hunted them to their lair and slew every last one. During the chase, they became lost in the trackless northern wilderness, and the mountainous winter weather forced them to hunker down and try to survive until early summer. While there, they found considerable hoard of stashed loot. It took them a long time to find their way back, also slowed by the burden of their treasure. When I was 13 years old,, during one of the times my took me along with him, alone, or sometimes with others, on some of his trips for trade with other tribes and cultures. Some of the lands we travelled through were rather dangerous. We didn't always have an roof over our heads. In some of the open camps, we needed to have a watch. On one of these trips a friend of my father's, Drorlin came along with his son Dorlin who was my age. The four of us took turns at watch. I had first watch (8 pm to 11 pm), Dorlin had the second watch (11 pm to 1 am), Drorlin third watch (1 am to 4 am), and my father on last watch (4 am to 6/7 am), that night. Unfortunately, Drorlin fell asleep on his watch! During the night, bandits snuck in, beat each of us badly to keep us unconscious, and stole my fathers tradegoods, most of our belongings, and even most of our clothes! I was the first to come to, and found that Dorlin's father had died from his wounds, and my father wouldn't awaken! Dorlin awoke to my cries of distress trying to awaken my father. I asked Dorlin what happened, and he sheepishly admitted he had knowingly fallen asleep, thinking we weren't really in any danger! Then I pointed out to him that his father wasn't unconscious, he was dead. He was at first in denial. Then when he realized, he wailed in agony. Then he began clawing at his face, and ran off into the misty morning. I ran after him, and a few minutes later, following his wails, it turned to a scream, and then silence. I sped up, and nearly ran off a cliff hidden in the trees and mist. Clinging to the roots of an overhanging tree. I looked down the 200 foot ravine, to see Dorlin's broken body on the rocks of the river. I was barely able to climb back up to safety. I was somewhat lost, and it took me hours, with my concussion, to find my still unconscious father. I rigged a litter to carry him, and began the many days-long journey back to our homelands. I returned 5 days later. The shaman said my father's skull was fractured and he was in a coma near death. They were able to save him, and eventually he regained consciousness, though initially his memory was lost. He did not even recognize me or my mother for the first few days. Slowly his memory returned, but he was never able to walk quite the same, his left leg dragged a little from the injuries to his head. About 2 years later, when I was 15, a Drow spy was spotted skulking around our tribelands between the Iron Forest and Ironhold. He was quickly captured and questioned. During the interrogation, the Drow claimed that my parents were working for the Drow! That they had received about half of their remarkable wealth as reward for their spying and interventions! According to the Drow, during their long absence, my parents didn’t defeat them, but instead were captured. Then in a cowardly trade for their lives, they became spies for the Drow. They were richly rewarded over the years for valuable information, not just about our own tribe, but all the tribes and other races and cultures they interacted with, frequently trading information, feeding their ongoing cowardice! When I heard the news, I was utterly ashamed! My parents were driven out of the clan, stoned by the others. They fled without me. My uncle, whom I had lived with during my parents occasional absences, did not blame me for my parents actions, and let me live with him. But the clan treated me differently ever since. And fellow Dwarves increasingly harassed me, and I found myself in increasingly frequent brawls. With increasing isolation, I retreated further into my own studies and musical expression. Yet another “oddity” compared to other dwarves. I increased my requests to go on supply runs with my uncle, and began to find that my music, singing, stories of lore, and my storytelling were of value to others at various taverns along the way. I was starting to come into my own as I grew into adulthood. Some years after their exile, while I was on the road performing, my mother approached me. I was furious with her, and my father, for their betrayal of our people. She plead that there was more to it. That they weren’t the cowards they were made out to be. And begged me listen for just a few minutes. I grudgingly agreed. She claimed the Drow were holding captive a baby sister born during during the time they were missing in the wild. She claimed their story true in part: the initial attack, the pursuit, getting lost. They hunkered down for the winter, she became pregnant while still lost in the wilderness. Then they were captured by the Drow. My father didn’t dare flee or fight with my mother so pregnant, and they surrendered. The baby, born while captive, was taken as hostage to force them to do the Drow’s bidding. My mother plead with me to help them get their daughter back. I eventually acquiesced. They said that the Drow would agree to return their daughter, if they would undertake one final mission for them: free one of their sorceress leaders held prisoner by the Dwarves of a neighboring clan between Ironhold and Dun Mines. I balked at this incredible betrayal of my people. My parents begged me to help them, that due to their exile they couldn’t do this on their own. They assured me that no one would be hurt if we did this right. Though my parents couldn’t show their faces to the dwarves, I was not forbidden. They already had prepared a forged document claiming prisoner was to be transported to the nearby Dwarven capital for sentencing, and that I had a couple of soldiers waiting outside as reinforcements (my parents). I could easily get the prisoner (bound in heavy warded irons, gagged, and blindfolded) out of the prison, and out the clan halls gates without incident. We would then meet the Drow at a prearranged location for the trade of their daughter for the prisoner. I had misgivings, but agreed, and all went according to plan. We freed the prisoner. But the evening of the trade, hours before we were to meet the Drow, a Dwarven patrol of 3 soldiers came across our campfire in a cave mouth, and asked to share our shelter from the stormy weather for the night. When they saw the prisoner, they began asking questions. We tried sticking to the story, but they were skeptical. Then a fourth member of the patrol, a young Dwarven soldier rejoined the others. It turned out to be my best friend! We hadn’t seen each other in years, since he had join the military, and I had been on the road. Joyfully he recognized me, and we gave each other hearty pats on the back. Then he saw my parents, and his comrades told him our story. He knew right away it was a lie! Quickly a fight ensued. We didn’t want to spill blood, but the Sorceress’s bonds had been loosened and were only for show. Before we could stop her, with a few spells, she killed the first 3 Dwarves! My friend narrowly escaped and fled to tell our kindred. My parents, undaunted, still attempted to follow through with the trade. Surprisingly the Drow followed through with their end of the deal. But we explained the concern about the patrol survivor. The Drow said they could leave us to our fates, or if we wanted to survive, they offered an alternative. If I envisioned our old clan home while placing my hand on a large orb, they would send me back, via a teleportation device, and I could intercept him before he could speak to the clan hall about my family. Maybe, somehow, with my own persuasive magic, I could somehow dissuade him from reporting us! Then I could then join my family at another location far away, in safety, and without a price on our heads. This felt wrong. I didn’t want to do it. Once again my parents plead with me, and had talk to their daughter, my very young sister whom I had never met before. Between her, and my parents explaining that if I didn’t do it, we would all be hunted by our clansmen, a blood oath likely made, until all in this branch of the family came to “justice”. In a moment of weakness I will always regret, I yielded. Through the Drow’s teleportation device, I appeared suddenly in my uncle’s clan house. He was sleeping (thankfully). But my aunt was up doing dishes. She didn’t see me “appear”, but turned before I could hide, surprised I was back. I told her I had just arrived, but was going to run a few short errands before calling it a night. She gave me a hug and kiss, and said she would be in bed before then, but she would have my favorite breakfast ready in the morning, to welcome me home. I am guilty of a terrible crime, and hope to some day redeem myself…. I found my friend just outside the clanhall inner gates. We argued. I tried some of my persuasive magic, attempting to change his mind, and failed. He was furious at my attempt, and a fight ensued. During the scuffle, I inadvertently slew my best friend. One of the few Dwarves outside of my family that accepted me as I was. I stood motionless, in shock over his body as he slid off my sword to the ground, cursed me with his last breath. But there was worse to come. I did not know the true ulterior motives of the Drow. I had given them an easy way into my people’s inner chambers. Using the same device, they teleported into the clanhall minutes after I did, using my visualization still stored in the orb. Since it was the middle of the night, they crept from house to house, and slew many Dwarves in their sleep before the alarm was raised. Once the alarm was raised, they teleported away. I thought the alarm was because someone spotted me killing my friend. So I ran to the outer gates. No one had suspected me, but as I ran out the clanhall’s gates before they could finish closing, guards saw me clearly, and called out to me. With a guilty conscience about my friend, I ran faster. All Dwarfdom believes I am responsible for the massacre of my clan! I do not know how I can ever return to my people. There is a reward on my head. Though by slaying my best friend I saved my parents and sister from a fate such as mine, I daren’t join my parents, for fear it would lead those hunting me straight to them. I have been moving constantly for over 2 years now. While I had a few close calls with bounty hunters during the first year, I have not run into anyone for about 6 months now. I keep on moving. Not only is most of Dwarfdom (and all their allies) looking for me, the Drow too are trying to hunt me down. They claim my parents swore an oath to them that binds them and their living children in purpetuity, to Lolth (or whatever their equivalent deity is), as eternal thralls. I have refused to accept this, and breaking such an oath, even one I did not swear, legends say invokes the Curse of the Oathbreaker. While I abhor the Drow in every way, and hope to find a way to free my family from the curse, I am vulnerable to coercion by the Drow if they use getting back together with my sister and parents as leverage. But they want me to do such horribly unbearable deeds! According to legend, oathbreaker's curse not only follows the oathbreaker, but also those around them and that aide them. I just turned 30. My Dwarven sister is now in her teens. I hope some day to rejoin my family, though I am so ashamed of them, and myself. I continue to dream of a day I can make amends to my clan, my slain aunt, uncle, and friend, and the other killed by the Drow due to my shortsightedness. I dream of one day being able to return to the great halls of The Ironwood Clan, as a hero, rather than as a criminal. Note to DM. It might be that my sister was with the Drow long enough, to have been indoctrinated by them before she rejoined my parents, and this will have long term consequences in how she turns out in adulthood. I am in reality (though I still do not know it), the adopted child of some distant relatives, that were killed in a highway robbery. My parent's hadn't been able to have children. When relatives started asking around for someone to adopt me (I was only a few months old at the time), my parents were out on the road for a while, and opted to take the adoption. Since they were gone for more than a year from their clanhold, they opted, rather than telling the clansfolk (and event their own parents) that I was adopted, to say I was theirs, so people would quite harassing them to have children. However, while those relatives were Dwarves, they didn't tell my parents that I had actually been rescued from a burned down orphanage, with a dozen other children of various races. There was a clerical error, and I was listed as “Khrandum the Dwarf”, son of unknown Dwarf father and Dwarf mother (whereabouts/condition unknown), Khrundalia. But in reality, my parents were human, but no one knows this, and all my records “prove” I am a Dwarf! So those relatives assumed I was dwarven, and when they died, my parents thought the same. But then as I grew, it was clear I was so different. My parents and relatives didn't know how to explain it, so assumed it was “a glandular condition”. When I didn't manifest Dark Vision, it was assumed to be a side effect of this glandular condition that also was making me get so tall. Who are my real parents? I don't eve know that I'm not a dwarf, I truly believe I am a dwarf, just that “I'm different from other dwarves, but as much a dwarf as the next dwarf”. So I don't even know to look for my biological parents. But what if someone out there in the ether knows the truth? If I become well know enough, will they approach me? What about the real mother of the real Khrandum? Will she seek me out if she hears rumors of my name (and my disgrace)? What about the real Khrandum, that ended up with someone else's name and listed as human? What has happened to him?